A face shape is a very defining part of every person’s style however many people don’t bother figuring out their face shape. It’s super easy and understanding your face shape will give you a better understanding of what’s going to compliment your features best. Whether it’s your next haircut, new glasses, jewellery or blush type – knowing your face shape will make any decision so much easier. SO recently we have been providing guidelines for choosing hairstyles that best suit the shape of your face, and we at kamdora.com have figured that not everybody knows the exact shape of their faces so hence we have put together steps to help you out. 1. Wash or wipe away any markings you’ve made, especially if you’re in a public restroom! 2. Stand looking directly forward into the mirror, with your back straight, your head high, and your shoulders back. If you have bangs, pull them out of the way. 3. Make sure the lighting is over head and not directional. Lighting will affect the shape you draw.54. Trace the outline of your face using lipstick, a bar of soap, chalk, a dry-erase marker, or some other non-permanent sketching tool, carefully trace the outline of your face in the mirror. 4. Don’t include your ears – just the edges of your face. -Start from the bottom of your chin, proceed up the edge of your face on one side past your cheek bones, follow the curve of your hair line, go down the other side of your face, and end up back at your chin. 5. Try to stay as still as possible while you do this. For best results, use a large mirror in a room with good lighting so that you can clearly see every part of your face. Most bathrooms have large mirrors over the sink, though any large mirror (like a vanity mirror in your bedroom) will work fine. You’ll also need a flexible tape measure (not a stiff ruler) that can comfortably hug the curves of your face, plus a piece of paper and a pen or pencil to write down your measurements. 1. To find the width of your face, measure across the top of your cheekbones. 2. Place the end of your tape measure just past the outer corner of your eye – this is your starting point. 3. Carefully lay the tape measure in a straight line across the bridge of your nose to just past the outer corner of your other eye this is the end point of measurement. 4. The tape measure should be resting on the top of the “apples” of your cheeks (in other words, just on top of your cheekbones). 5. Read the number on the tape measure and record this measurement. B. Measure your jaw line. Next, you’ll want to determine the size of your jaw. Look straight ahead into the mirror and find the widest part of your jaw. Usually, this is an inch or so below the bottom of your ear. This will be the starting point for your measurement. 1. Measure from this spot to the tip of your chin. 2. Then, simply multiply this number by two to get the combined length of both sides of your jaw. Look straight ahead into the mirror and find the widest part of your forehead. Usually, this is about halfway between your eyebrows and your hairline. 1. Place the start point of the measuring tape on one side of your forehead at its widest point. 2. Run the measuring tape along your forehead horizontally until you come to the same point on the opposite side of your forehead. 3. Read the number on the tape measure and record this measurement. D. Measure the length of your face. Finally, it’s time to determine the length (or “height”) of your face. 1. Find the exact middle of your hairline (the line formed where your hair meets your forehead). 2. Start your tape measure at this middle point. Run the measuring tape down your face, over your nose, and to the tip of your chin. 3. Read the number at the end point and write down this measurement. 1.try to measure from the point where your hairline would be. 2. Unless you’ve shaved your head within the past few days, you should be able to feel the light “stubble” of new hair growth at the top of your forehead. 3. If you’re unsure, estimate by raising your eyebrows and measuring from just above the highest wrinkle that forms on your forehead. Fit your facial measurements to a face type. Every person’s face is different (unless you’re an identical twin!) However, the vast majority of faces fit into one (or more) of several categories. 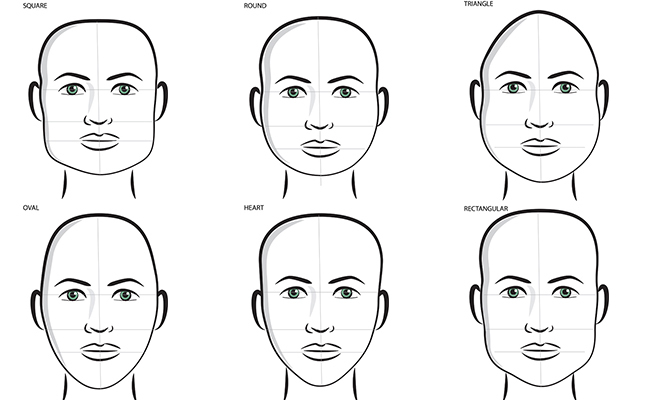 These facial categories are: Triangle, Heart, Square, Oval, Round and rectangle. Use your measurements to determine which category (or categories) you fit into! A rectangular face shape is longer than it is wide and slender. The forehead, cheekbones and jaw are the same width. are about as long as they are wide – their cheek and length measurements are within about an inch or two of each other. In addition, the cheek, forehead, and jaw measurements for square faces should be similar – the edges of a square face should be almost straight up and down. A square face’s jaw should have clear, sharp angles at its widest corners. are similar, proportionally, to an upside-down egg. They are longer than they are wide, with a forehead that is slightly wider than the jawline and a gently rounded chin. like square faces, are about as wide as they are long. However, they have a relatively small forehead and a small, curved jawline. If your “cheek” and “length” measurements are within an inch or so of each other, your forehead measurement is smaller than your cheek measurement, and your jawline lacks the sharp angles present on square faces, you have a round face. are the opposite of heart-shaped faces – they’re widest at the bottom and skinniest at the top. Triangular faces have long, wide and square jawlines and relatively narrow foreheads. Now that you understand your body a little better, you can follow up on ways to best compliment your face shape when you’re trying to choose your next hairstyle or picking out makeup types. Just imagine the amount of compliments you’ll start getting when you learn more about the best styles for your features!